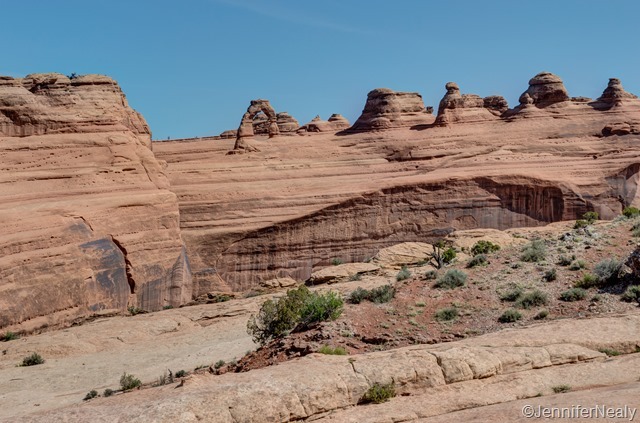 Last year when Deas and I were planning our trip, we had multiple people tell us how amazing southern Utah is. 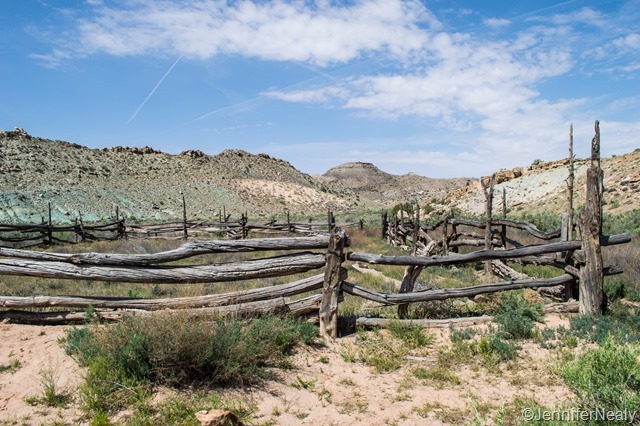 We planned on adding it to the itinerary, but we made the rookie mistake of not looking at the average temps for the summer, and by the time we were close to Utah, the temps were soaring to over 100 degrees. So we ditched Utah and extended our time in Colorado, and therefore it was a high priority for the 2014 trip to make it to Utah before it got to hot. And so far it looks like we have timed our visit just right! Our first stop was Moab. We originally planned to spend 7-10 days here, but when I called to make a reservation (at the last minute in typical Nealy fashion), we found that all the parks in town were booked for the weekend we wanted to be there, due to a classic car show. So we bumped up our arrival to a Sunday and booked a spot for 4 nights at the Portal RV Resort just north of town. 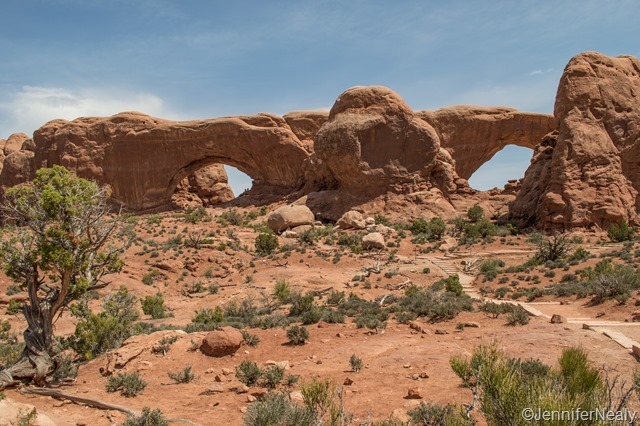 We spent our first day there exploring Arches National Park, which was just about 5 miles north of our RV park. 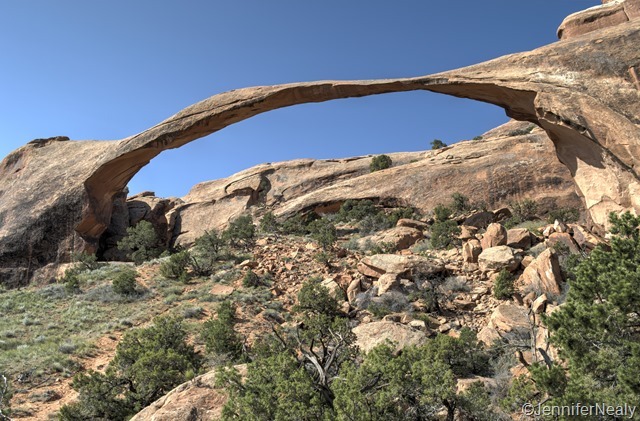 The first hike we did was to the Landscape Arch, which at 290 feet is considered to be the longest natural arch in the world. As soon as we started on the trail (which is about 1.5 miles round trip), we were surrounded by fascinating scenery and really large rocks. The trail is very easy and the view of the arch at the end was definitely worth it! 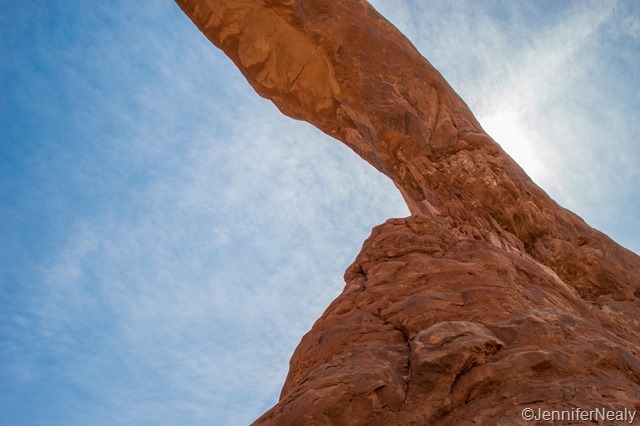 Supposedly you used to be able to hike right up underneath the arch, but since large chunks of it kept falling off (one as big as a car), the park has closed that section of the trail. 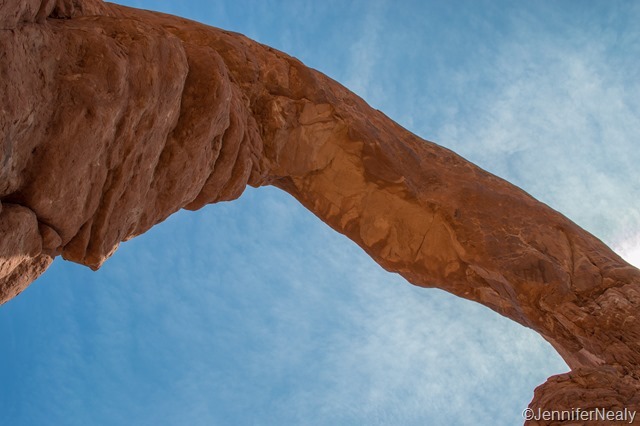 The most famous arch in the park is probably the Delicate Arch, which is featured on Utah’s license plates. 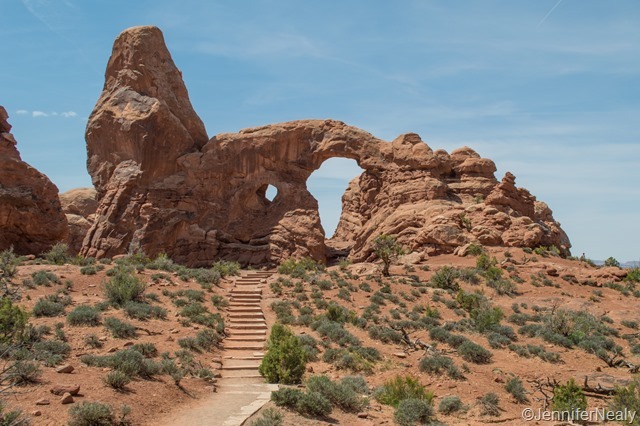 There is a 3-mile round trip hike to that arch that Deas and I wanted to do, but we had the dogs in the car and it was too hot to leave them along for that long (dogs aren’t allowed on trails in national parks.) But there is another shorter hike you can take that gives you a long distance view of the arch, which we did instead. See those teeny tiny specks under the arch? Those are people! We did plan on going back to the park another day to do this hike, but unfortunately didn’t make it back as planned. 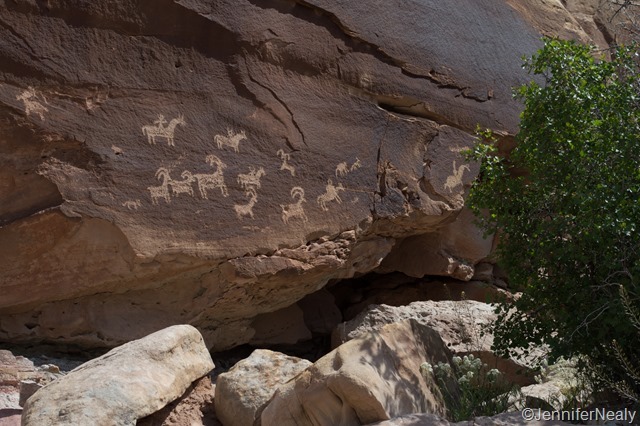 Now we have a reason to come back to Moab yet again! We drove the entire park and stopped at just about every scenic turnout. 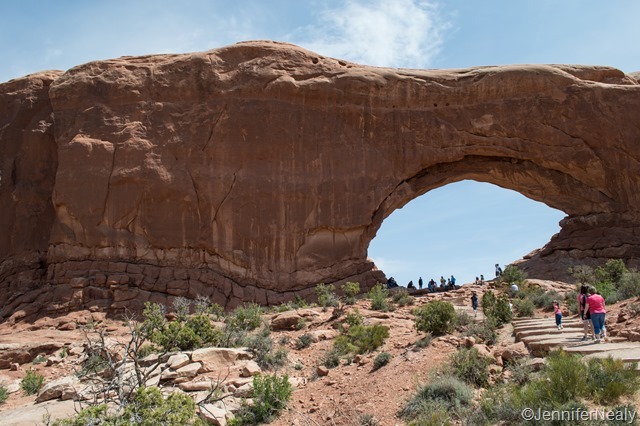 We viewed lots and lots of arches – all spectacular in their own unique ways. We were able to hike right up under one of the arches. I laid down underneath it but it was so large I couldn’t get the whole thing in my camera frame! There are other interesting things to see in the park besides the arches. 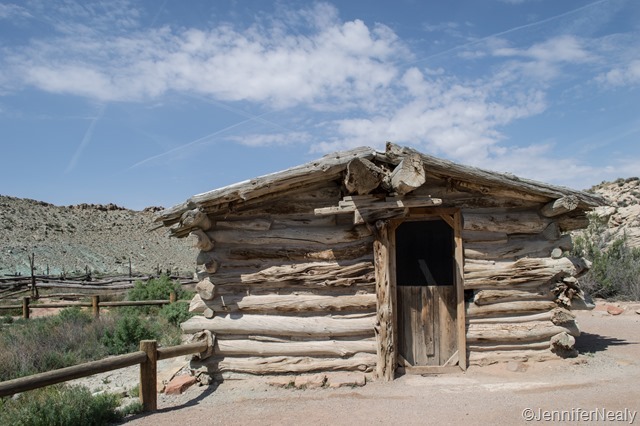 Wolfe Ranch is the one-room cabin that was built by John Wesley Wolfe in 1906. Six family members lived in this cabin for 2 years! Just up the path from Wolfe Ranch we saw a sign indicating there were some petroglyphs, so we went in search of those as well and easily found them. Very cool! 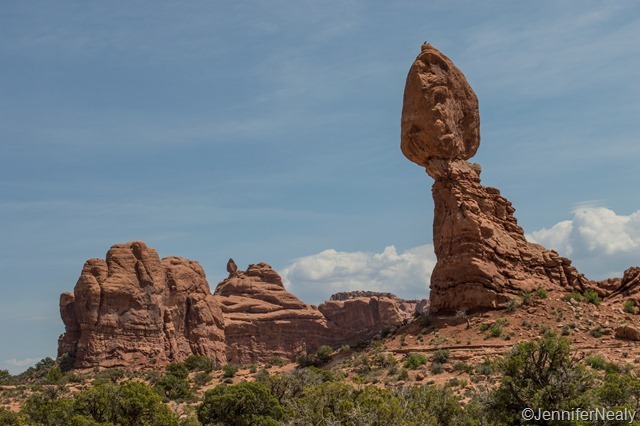 And last but not least we saw the crazy-looking Balanced Rock. The rock on top is 55 feet – the size of 3 school buses! Arches National Park is beautiful and I can’t believe we only spend one day exploring it. 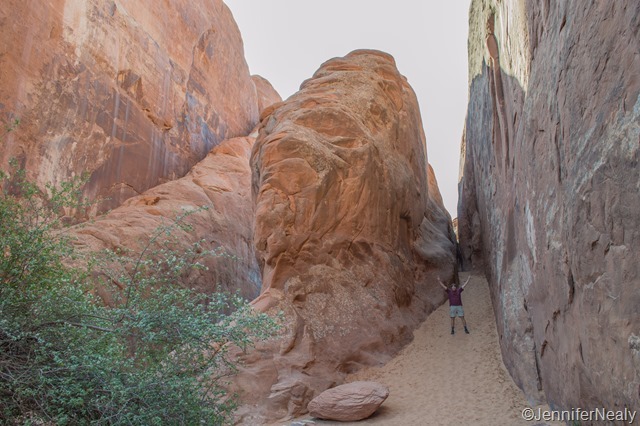 But there were plenty of other things to see and do in Moab which I’ll save for another post! Park Review: Portal RV Resort was very convenient, well priced, full hooks-up sites, and all sites were spacious and level. There are two sections – the resort and the campground. We stayed in the campground side but walked through the resort area. The resort sites are paved and larger, and there was better landscaping, but other than that there weren’t a lot of differences. We would happily stay in either side. I didn’t get a picture of our site, but we were right under a large tree that gave us lots of shade. There was a small fenced-in dog area nearby that made it very convenient for us to walk the dogs. It was very clean and well maintained and we would definitely stay here again. Thank you so much, and congratulations on getting your new rig! The insurance question is a great one but I’m certainly no expert. What I have heard time and time again is that it’s important to get insurance that is specifically geared towards RVs. We have ours tied in with our house/car insurance, which was the cheapest option, but honestly may not be the best option if we’re ever in a situation where we really need it (crossing my fingers that doesn’t happen!) Here’s a couple of links to a post from other bloggers that have some good information – I hope that helps! Good luck with the sale of your house and hope to see you on the road soon! Nothing more beautiful than red rocks against that striking blue sky. Love your images! Thank you! We were blessed with great weather while we there. I just wish we’d had more time! Hi thanks so much for sharing loved the photos and info. So what were the temps while you were their? Thank you! We were there 4/20-4/24. I don’t remember the exact temps, but I think it was high 70s/low 80s during the day, and in the 50s at night. Just about perfect! Yes, I definitely wish we had spent more time there. Our original plan was to spend a week there, but we ended up leaving early and going to Bryce because Hans & Lisa were at Kodachrome and we wanted to see them. We did a few other things besides Arches but I saved it for another post. We saw just enough of it to know that we want to go back! And I picked Portal because I read about it on your blog! 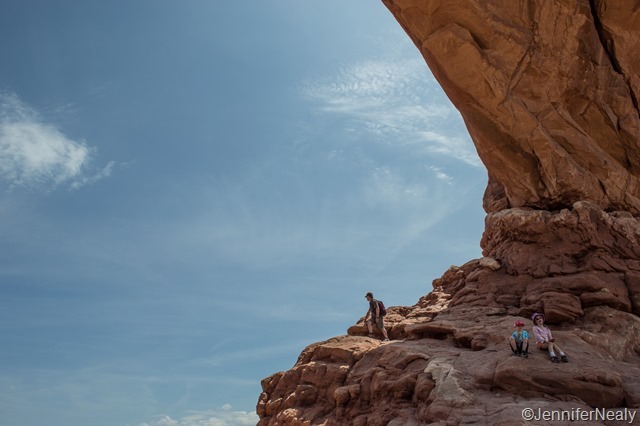 Moab is one of those places that leaves you with more to see for another visit no matter how often you come. We enjoyed our stay at Portal. Definitely the nicest park in the area. Glad we could help a little. Nice that you did get to hook up with Hans and Lisa again. They are wonderful people and good hiking buddies!! 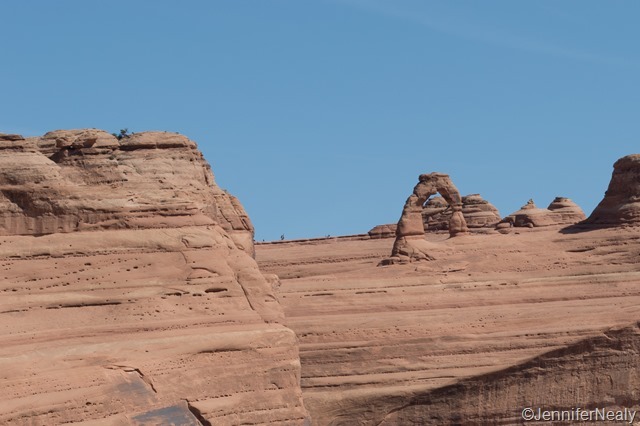 Several years ago we made our first trip to Arches National Park. Being newbes we did not know we needed reservations and we found the park full when we got there. We were told to go back towards Moab and turn left on Highway 128 where we could find BLM camping. What we found was a great boondocking area right on the Colorado River. We never ended up at the same park as Hans and Lisa, but we did get to meet up with them 3 times. May try to hook up with them again somewhere in WA if we head that way.